The traditional and most popular filling is creme patissiere – a light vanilla pastry cream. The flavour works well on its own, beautifully complimenting the delicate taste of the choux pastry and the distinctive flavour of the caramel, and can be further complimented by serving the croquembouche with a chocolate sauce or a fruit coulis. If you prefer, the creme patissiere can be flavoured with the fresh flavour of Limoncello. 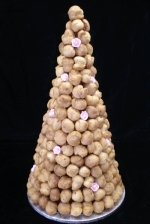 Fresh cream is not suitable for use in a croquembouche; it becomes too warm with the caramel, and the entire structure will become unstable. Decorations for your croquembouche How big is a standard croquembouche?